In a blender, add all the ingredients except the gelatin and blend for 10 seconds. turn the blender down to the lowest setting and slowly pour in the gelatin. Then blend on high for 10 seconds. 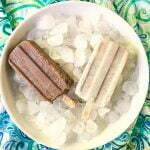 Pour into popsicle molds and set into freezer. Wait about 20 minutes and then add in the popsicle sticks. Freeze for about 2 hours.